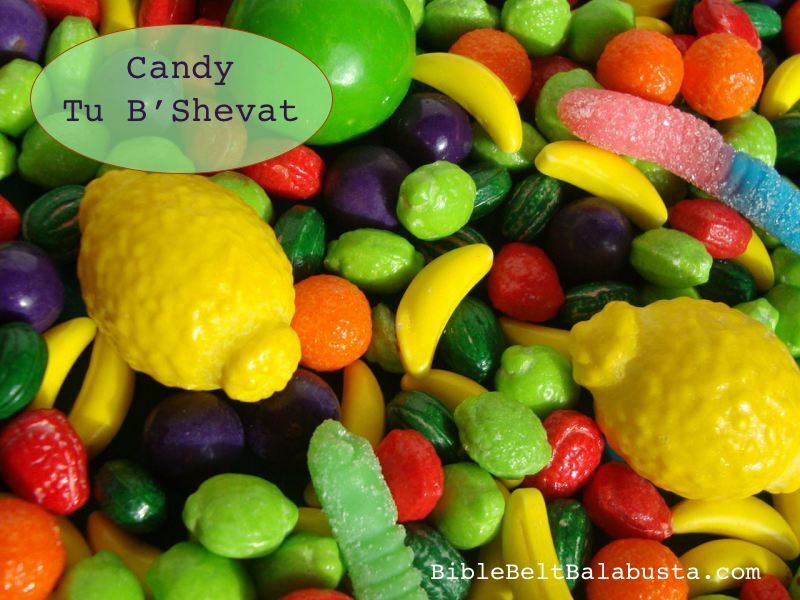 I wrote an article about using candy as an “enrichment” activity for Tu B’Shevat at Kveller.com: Tu Bishvat in Candy Land. Do read it. The hate mail I received as a result of the article indicates that the haters did not read it, else they would have learned that I do not propose that candy representations of actual tree fruit should replace traditional observance of Tu B’Shevat. Nor do I think that to let kids crush Oreos to produce “Edible Dirt” is an acceptable alternative to planting real seeds in real dirt. The word “enrichment” is a clue, my vigilant friends. Tiny Runts and Nitwitz are colorful, fake-fruit sugar bombs that my kids like to play with more than they like to eat. They are quite fetching as proportionally-sized tree fruits for Playmobil and Barbie festivities. 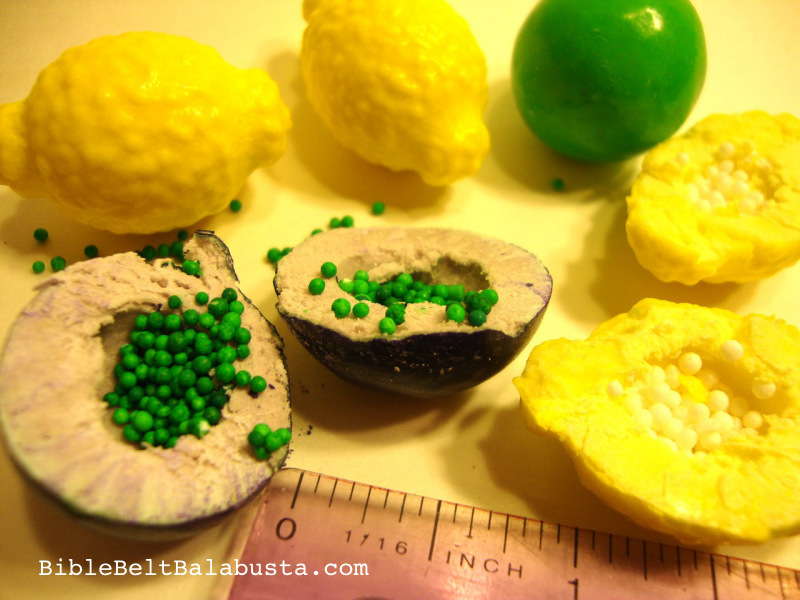 Fruit Shakers are bigger, and are actually gumballs filled with tiny, rattling, candy “seeds.” Of course, these candy seeds are the logical thing to put in candy dirt! Does this mean we cannot plant real seeds in real dirt with children? Heavens no, my darlings. Lighten up. I never claim any of my activities are perfect for everyone. I offer ideas. For free. Take them, or leave them, but do try not to savage me with hateful comments. Inside the gumballs are tiny seeds. OF COURSE WE HAD TO “PLANT” THEM. Nutritional Disclaimer: Remember Passover all-chocolate seders? De rigeur at some point of Jewish middle school, high school or college life. 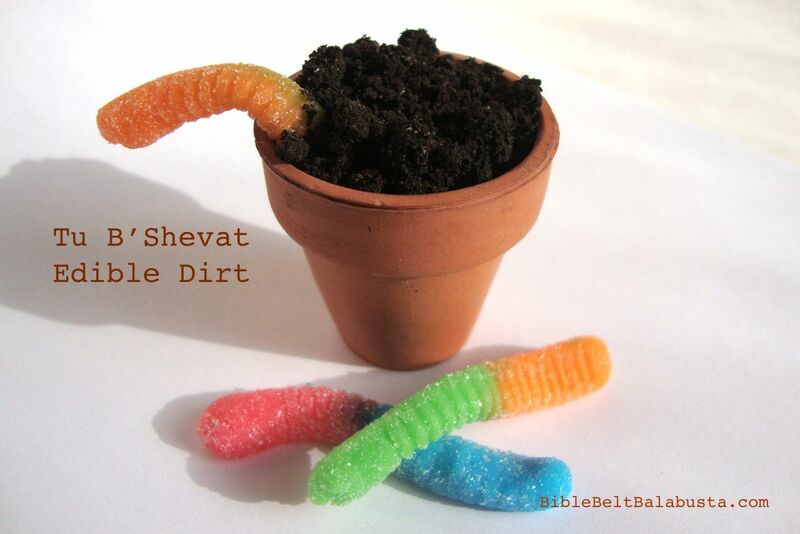 Well, my little Tu B’Shevat snack-tivities aren’t nearly as sugary as a blow-out chocolate seder. So please don’t scold me for contributing to childhood obesity. Everything in moderation. Besides, I’m not selling a 15-course Tu B’Shevat seder (although I admit, I’m interested). This is just a snack, y’all. Well, dessert, really. Once a year. ALL my TU B’SHEVAT posts: projects and activities that, for the most part, do not involve sugar, artificial colors or flavors. Nature walks! Real plants! Tree hikes! Pinecone Birdfeeders! Parsley for Passover! And other lovely things that deserve exclamation marks! 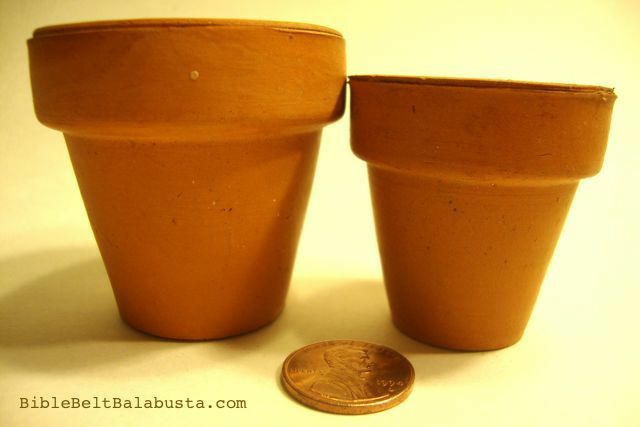 Two sizes of mini terracotta pots. Instant portion-control. Barbie: Here are links to Tefillin Barbie and Computer Engineer Barbie, whom I adore, and the fact that they were created by the “first woman in modern times to have written an entire Torah” makes me love them even more. My so-called Hadassah Barbie is not affiliated with Tefillin Barbie in any way, except as a tribute (Hi, Jen!). 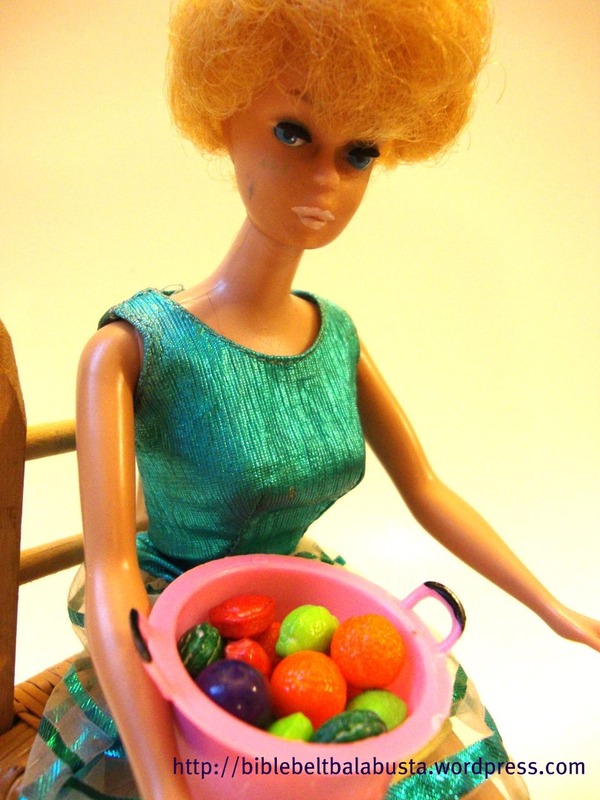 The above 1958 Barbie was a hand-me-down from my sister. I still have all the outfits and killer accessories. Other mini-fruit holiday opportunities: The tiny fruit-shaped candies are also good for decorating an edible sukkah on Sukkot, and can represent “first fruits” (bikkurim) at Shavuot. Runts aren’t, Nitwitz are. Fruit Shakers are. Oreos are—hallelujah—and if you haven’t seen Marjorie Ingall’s article about Oreos and kashrut and culture, see it now. If you are concerned about a terra-cotta pot—produced God-knows-where out of God-knows-what—employed as a container for food, then use a Dixie Cup and call it a day. 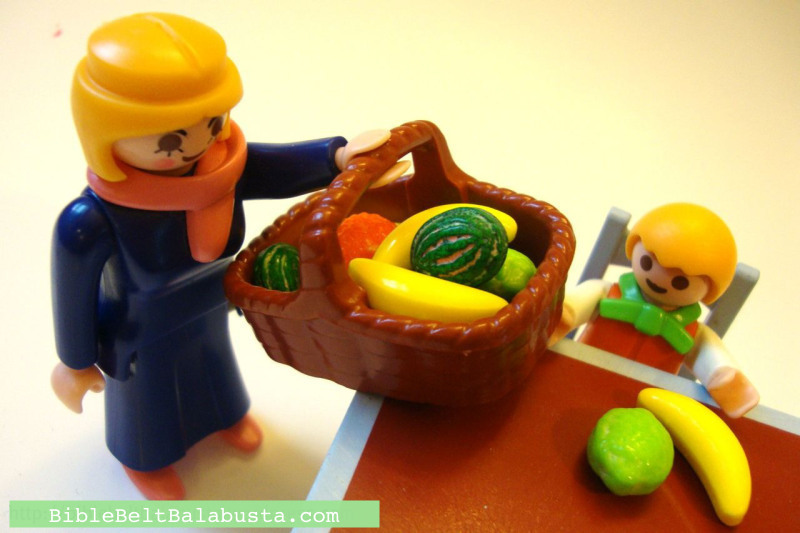 This entry was posted in Crafts, Edible Craft, Kitsch, Tu B'Shevat and tagged kosher, Playmobil, Tu Bishvat. Bookmark the permalink. Hadassah Barbie looks like she’s wearing a sheitl. One of those really cheap ones that’s been in service a good decade longer than it should have been. Bit incongruous with the bare arms, though. The gummy worms in pots are total genius. I might have to steal that idea. I am so busted on the bare arms! Next time, I’ll select a more modest frock.